Your Vehicle’s security goes hand in hand with your own. Afterall, we spend quite a bit of our time in our vehicles these days, so it only makes sense to be a safe and secure as possible. Since Car Security means different things to different people we are going to take a brief look into the different areas involved in being and feeling safe from the outside threats that drivers may or may not know they are facing. Never leave your car running when making a quick stop. It invites any would be theif to an opportunity that they weren’t otherwise looking for. You could use an extra Key to allow you to keep the car running but locked on those really cold days where starting the engine takes some time. When selling your car or motorcycle don’t allow just anyone to test drive it. Believe it or not, people have been known to just drive away. Get Call back numbers from people who call your ads, and get Identification. Checking a potential buyer’s drivers license just makes sense. Make sure you keep copies of all your registration and insurance information at home, as well as in the car. Remember to always park your vehicle in well lit areas. 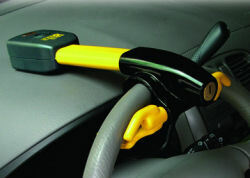 This improves your personal safety as well as your car’s security. Car and Vehicle security devices all do different things. (Immobilizers disable the vehicle to prevent theft for instance) Here we are going to look into the different types of gadgets and accessories you can buy to improve the overall safety and security of you, your passengers, and your vehicle. These locks prevent someone from jumping in and driving away with your car. The idea is, that if you can’t steer it, you cant steal it. They are also often used to prevent unauthorized teenage drivers from taking the car without permission. Two popluar choice for steering wheel locks are both from Swat Lock. The alarm will sound if you car gets a window tapping or jolt, and you can use either the 3 included keys or the ir remote to disarm the swat lock. Both are very popular due to their ease of installation and added car security. These types of tools are used to warn other drivers of an accident, signal help, prevent an accident (as is the case of the nap alarm), break out of a car after an accident, or possibly even ward off an attack from inside your vehicle. However, it does not come with any roadside markers or led warning lights for your car. 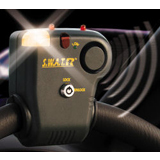 Some Drivers may also feel more comfortable with a flashlight stun gun in their arsenal. GPS Tracking Devices work in one of two ways. Passive and Real Time. Real Time GPS Tracking Devices like the SleuthGear Live Vehicle Tracker, monitor your vehicle live while its on the move. This usually means that you have to subscribe to a monthly fee, however this may be a very valuable feature for business owners who have employees on the road. Passive GPS Car mounts like the iTrail (which doesn’t have to be mounted to a car to be used) record their movements internally to a map and then later display their travels when you retreive the unit and download the travel information to a computer hard drive. Because passive gps units like the itrail are much more cost effective, they have become very popular. 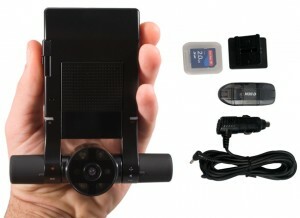 If you have read our article on Dash Cams, you know that there are many reasons to install a dash cam other than just to record scenic road trips. Have you ever been in a situation where someone lied about fault in an accident? Do you think you could become a target of someone purposely creating an accident to start an insurance claim? Have you ever experienced someone getting out of there car in a road rage? We’re they angry at you? Do you worry about young drivers in your vehicle? Do you worry about employees in your vehicle/s? Would you like a chance to critique their driving performance? Would you like to protect yourself and other drivers of your vehicle against fraud? Would you like to record a beautiful scenic road trip? If you answered yes to any of these questions, you may want to give our article on dash cams a read. The Dual car camera with GPS lets you record images from both both inside and outside your vehicle and also has a G shock sensor that records automatically if you get into an accident as well as loging your exact location, speed and direction. Because the dual car camera offers benefits of GPS and Dash Camera recording, it is one of the most popular choices for those looking to improve both car safety and security. To see more products that deal with automobile safety and security visit StunGunMikes.com and check out our Car Security Section. You’ll be glad you did!